How Much Caffeine Is in a Monster Energy Drink? Monster Energy is owned by the Hansen Natural Corporation, and their beverages first hit the market in 2002. In a surprising contrast to Hansen Natural's reputation as a healthy, preservative-free beverage company, Monster Energy drinks have large amounts of caffeine, sugar and sodium. 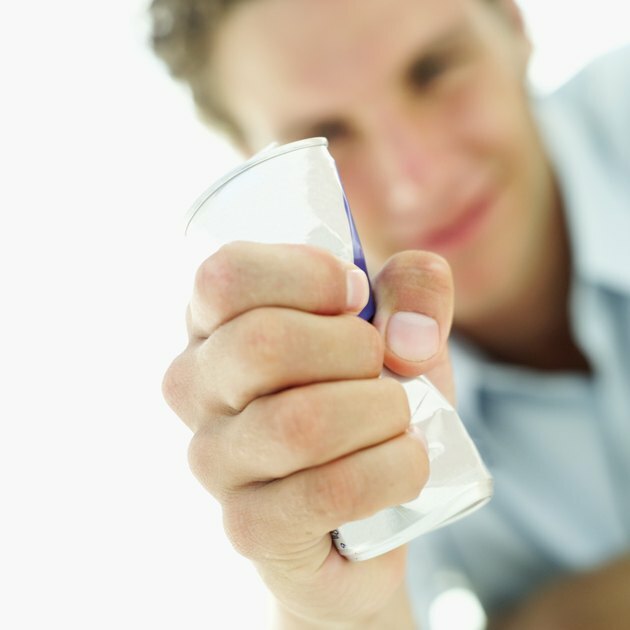 Monster Energy drinks contain more caffeine than most brands of coffee and soft drinks. Caffeine accounts for one part of what Monster Energy refers to as its Energy Blend. This blend of ingredients provides the rush you feel after drinking the beverage and includes the chemicals L-carnitine, glucose, caffeine, guarana, inositol, glucuronolactone and maltodextrin. Each 8 oz. Monster Energy drink contains 1,200 milligrams of this blend, 80 milligrams of which is from caffeine. By comparison, an 8 oz. can of cola contains between 30 and 40 milligrams of caffeine, while other flavored soft drinks contain slightly more. An 8 oz. cup of brewed coffee contains 95 to 200 milligrams of caffeine, and an 8 oz. cup of tea has about 40 to 120 milligrams. Decaffeinated coffee and tea have residual amounts of caffeine, about 2 to 12 milligrams per cup. Monster Energy drinks provide about 200 calories per 8 oz. can. Each can also contains 54 grams of sugar. Monster Energy drinks are high in sodium: about 360 milligrams per can. Both sugar and sodium are related to high blood pressure and cardiovascular disease, and the American Heart Association recommends limiting both to prevent heart problems. Monster Energy fortifies its drinks with an abundance of B vitamins, which are helpful for energy metabolism and immune system health. Caffeine's primary effect on the body is to stimulate the nervous system, producing a burst of energy. Too much caffeine, however, may lead to nervousness and anxiety. Caffeine is also a diuretic, causing increased urination and dehydration. Excessive amounts of caffeine can inhibit the body's ability to absorb calcium, leading to bone-loss over time. Like sugar and sodium, caffeine may result in cardiovascular problems. Can Excess Caffeine Cause Weight Gain?